Screenshot of video at https://wnep.com/2019/04/14/mentored-youth-trout-day-2/. WNEP featured Columbia County Conservation District (CCCD) and PA Fish & Boat Commission’s Good Water = Good Fishing event on a PA Outdoor Life segment. CCCD Watershed Specialist Brittney Hartzell is featured in the video. Click here to view the nine-minute segment. 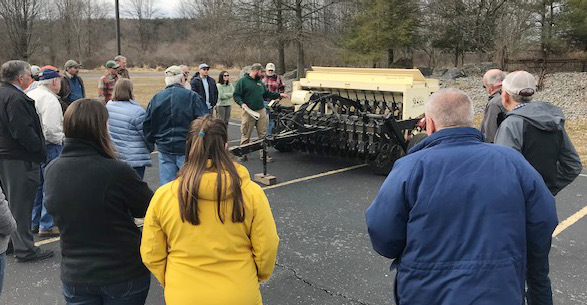 Participants learn about the Game Commission’s no-till seed drill that is available for use by landowners. Photo provided by Columbia County Conservation District. 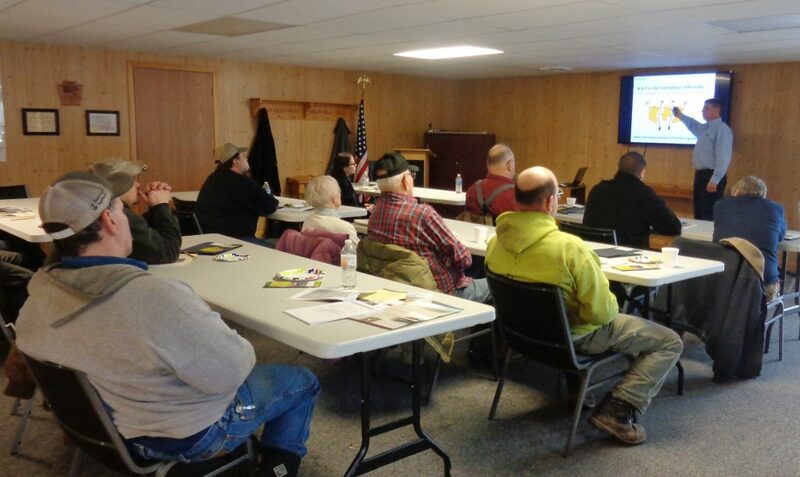 The Columbia County Conservation District used a Conservation Reserve Enhancement Program (CREP) mini-grant, administered by PACD, to host a CREP Workshop at the Montour Preserve in Danville, PA on March 28, 2019. Forty-five people attended the workshop and heard presentations from the Farm Service Agency, USDA Natural Resources Conservation Service, and PA Game Commission about the new mid-contract management rules and how landowners can use CREP to improve wildlife habitat and water quality. A demonstration on how to use the Game Commission’s no-till seed drill was also part of the workshop. Financial support for the CREP Mini-grant Program is provided by the Pennsylvania Association of Conservation Districts, Inc. through a Growing Greener Watershed Protection grant from the Pennsylvania Department of Environmental Protection and with additional support from USDA-NRCS. (Left to right) Representative Jeff Wheeland, Senator Gene Yaw, PACD Executive Director Brenda Shambaugh, PA Department of Environmental Protection Northcentral Region Director Marcus Kohl, and Lycoming County Conservation District Manager Mark Davidson pose for a photo during the legislative breakfast. 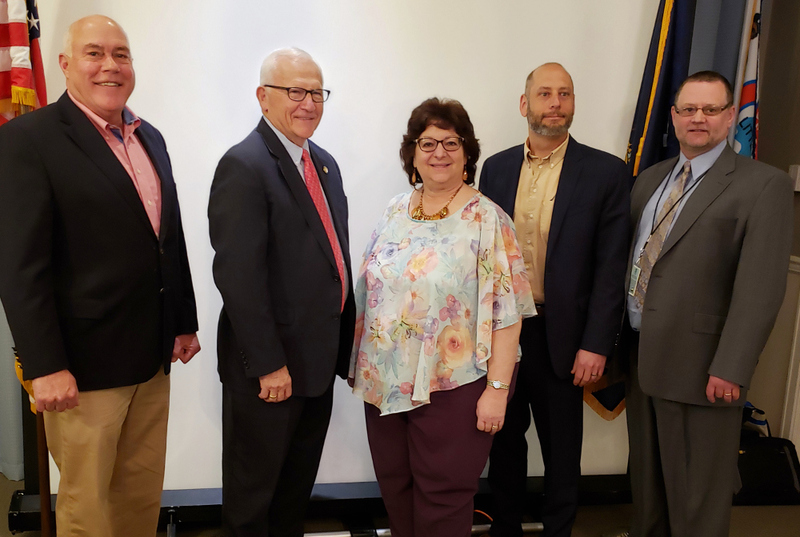 On April 11, 2019, the Lycoming County Conservation District held a legislative breakfast at the Genetti Hotel in Williamsport, PA. PACD Executive Director Brenda Shambaugh traveled to Williamsport for the event. 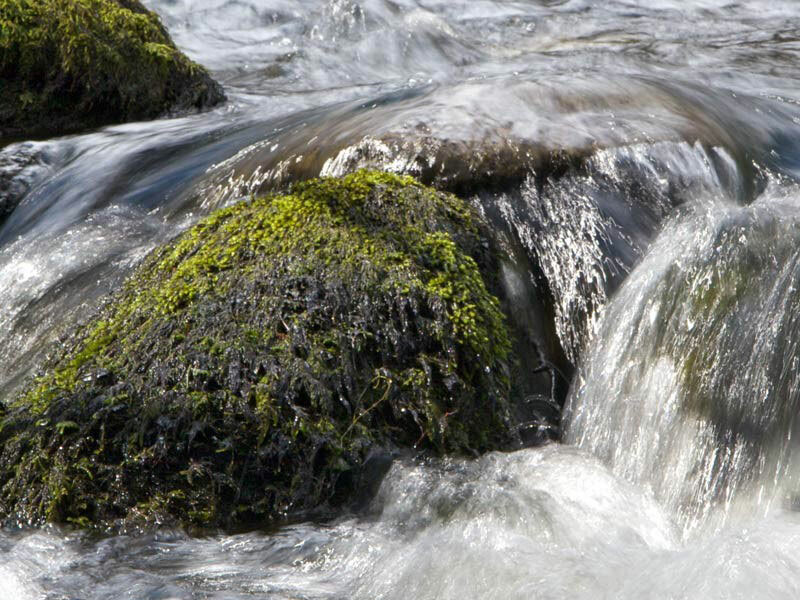 Topics of discussion included stream restoration efforts in the county and the state budget. 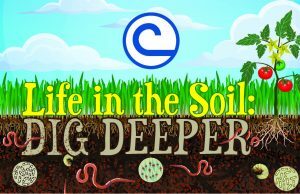 The National Association of Conservation Districts 2019 Poster Contest theme is “Life in the Soil: DIG DEEPER.” PACD will be accepting photos of your county’s winners until June 30, 2019. We can’t wait to see all the artistic entries for this year’s theme! Contact Jann McNamara at 717-238-7223 x 106 or jmcnamara@pacd.org with questions. The April 30 deadline to recognize a fellow conservationist by nominating him or her for a PACD Award is fast approaching. Click here for more information and a nomination form. Contact Jann McNamara at jmcnamara@pacd.org with any questions. Participants in the Basic Level of Agricultural Conservation Technical Training pose for a group photo on the first day of training. Thirty-four individuals attended Agricultural Conservation Technical Boot Camp Training – Basic Level April 1-5, 2019, at Fort Indiantown Gap in Lebanon County. Attendees included staff from conservation districts, the USDA Natural Resources Conservation Service and affiliates, farmland preservation, and the PA Department of Environmental Protection. The training is sponsored by the USDA Natural Resources Conservation Service and the State Conservation Commission. PACD works with these partners to coordinate the training. Eric Konzelmann, Assistant Manager for the Montgomery County Conservation District, presents to a full house during Topic-based Technical Training on April 3, 2019. Close to 130 staff from 46 conservation districts and the PA Department of Environmental Protection attended 102/105 Topic-based Technical Training April 2-4, 2019, at the Wyndham Garden State College in Boalsburg, PA. Participants received training on Chapter 105, erosion and sedimentation control (E&S) on Chapter 105 permitted sites, delegation agreement levels and responsibilities, and a range of compliance and enforcement topics. This training was funded through a grant from the PA Department of Environmental Protection and made possible through the cooperation of the PA Association of Conservation Districts and Pennsylvania’s conservation districts. There are two dates for conservation districts to save for upcoming leadership development training. The 2019 New Manager Bootcamp Training will be held June 18-20 at Toftrees Golf Resort in State College, PA. The Building for Tomorrow 2019 Management Summit will be held September 4-5 at the Wyndham Garden in Boalsburg, PA.
More information will be distributed as it becomes available. Contact Matt Miller at mmiller@pacd.org with questions. Nominations are due by April 30. Click here for more information and a nomination form. Contact Jann McNamara at jmcnamara@pacd.org with any questions.